Highest Rated DVD to date ~ 5 skulls " A Must See!" " Do not miss this one." With guidance from surviving family members, clergy, and eyewitnesses, and unlimited access to never-before-seen files and artifacts, the Booth Brothers and their team of paranormal experts journey in the very steps of the boy who was tormented by demons and the Devil himself before being delivered from possession by the rite of Catholic exorcism. The many fans of the original “Exorcist” book and movie, and those who have read and enjoyed Possessed, the 1993 book about the event by author Thomas B. Allen, will be pleased to find that The Haunted Boy fills in many of the gaps left by those works. It answers many of the lingering questions, not only about the lives and works of the priests involved in the gargantuan effort to free the possessed boy (in particular Father William S. Bowdern, S.J., who was the lead exorcist during the rites), but also about the unnamed victim himself who, we learn, went on to lead an apparently normal and productive life following his deliverance. In their own unique and compelling style, the Booth Brothers adeptly guide the viewer through haunting locations connected to the original exorcism, including the asylum and house where the possessed boy was confined – and his demons confronted – during his possession. In each location, the paranormal professionals assembled by the Booth Brothers use every tool at their disposal to search for residual evidence and whether the demonic entities exorcised from the boy still pollute the locations, even after all these years. The Booth Brothers can also be commended for not missing an opportunity to educate the general public about the dangers of the paranormal; the film includes footage of the brothers speaking to a classroom filled with students approximately the same age as the possessed boy when he began experimenting with the Quija board, the singular object believed responsible for bringing about the harrowing circumstances of the Haunted Boy’s demonic possession and torment. 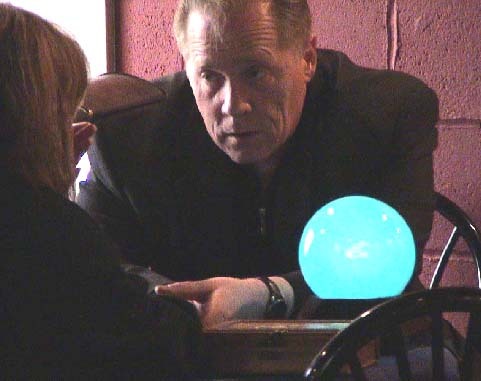 The Booth Brothers also provide further evidence of the dangers of Quija through interviews with individuals who have experienced psychic and physical attacks – even contact with infamous serial killers! – through ignorant experimentation with the board. With moody music created especially for the film by Christopher Saint Booth, paranormal evidence such as real-time EVPs and camera-captures, and disturbing archival, architectural, and expert evidence, the Booth Brothers’ The Haunted Boy is a do-not-miss for Halloween and a must-own for paranormal experts and fans alike. THE HAUNTED BOY, The Secret Diary Of 'The Exorcist'! (OCTOBER 2010) Spooked Television Releasing. Unrated/Packed with Bonus Features. While filming a haunted asylum in St. Louis, Missouri, documentary filmmakers uncover a secret diary of the infamous 1949 exorcism involving a 13 year old boy possessed by the devil that later inspired the book and movie, The Exorcist. Utilizing hi-tech paranormal gadgetry along with a legion of supernatural experts, they search out to capture the scariest entity known to man, The Unholy Ghost. Nothing you have ever seen or heard before gets you closer to the ungodly truth of what really happened in this most terrifying, best selling story of all time! This is the untold-real story of, The Exorcist, a chronicle of true events based on the actual priest's secret diary the world was not to see, Until Now! The Haunted Boy THE SECRET DIARY OF “THE EXORCIST” ~ 5 Skulls. 1 Skull- Not worth the disk it is printed on. 2 Skulls- WATCH IT ONCE AND FORGET IT! 4 Skulls- Great DVD- for any collection every second you watch! Highest Rated DVD ~ 5 skulls " A Must See!" " Do not miss this one." When it comes to unraveling the real truths of the old tales of the Devil Baby of Old New Orleans no one in the entire state of Louisiana knows his true secret origins better then Alyne. Alyne Pustanio is one of the leading paranormal experts in New Orleans and the surrounding region. Unparalleled in her knowledge of the folklore and genuine history of haunted New Orleans, Alyne takes you beyond the “tour gore” and “fakelore” into the real heart of the Most Haunted City in America. Alyne has held audiences spellbound all over the country as an engaging public speaker. A sixth-generation New Orleanian, a descendant of the family of American classical composer Louis Moreau Gottschalk and of Portuguese and Italian immigrants who can trace their lineage back to European Gypsies, many of Alyne’s ancestors were present at very beginning of some of the most notorious events in New Orleans history. It from these first-hand accounts that Alyne has crafted her true and haunting tales of Old New Orleans including The Devil Baby of Bourbon Street, The Black Lady of Lafitte’s Blacksmith Shop, The Beast Ramon, Violette The Zombie Child of New Orleans, On The Trail of the Loup Garou, and most especially the story of the notorious Lalaurie House Haunting. In fact, her original sources and research work on the Lalaurie case has earned her the appellation of “Lalaurie Scholar” among many of her peers. Alyne Pustanio’s work in the field of the supernatural and unexplained is the natural result of a lifetime of exposure to the paranormal. Two of her great-grandmothers were gifted, sought-out psychic mediums, and through her mother, an avid spiritualist, Alyne personally met many of the icons of the paranormal/occult field when still just a schoolgirl including Hans Holzer, Ed and Lorraine Warren, Dr. Lori Poe, the Original Witch Queen of New Orleans Oneida Toups, Guru Maharaj Ji, Jeanne Dixon, Leo Buscaglia, Manly Palmer Hall, and the phenomenal Israel Regardie. Alyne Pustanio is the leading contributor to the wildly-popular paranormal website Haunted America Tours (www.hauntedamericatours.com) and has recently become a regular contributor to the books of Brad Steiger, the most senior and well-respected expert in the field of the paranormal and unexplained. Alyne’s works have recently appeared in Steiger’s bestselling book Real Zombies, The Living Dead, and Creatures of the Apocalypse and she will soon be featured in Steiger’s newest work, Monsters,(working title) slated for worldwide release in September 2010. Additionally, Alyne will be featured in several of Brad’s upcoming books writing on the subjects of alien visitations and ancient civilizations, and that legendary creature of fear and folklore, the werewolf! Personally traveling extensively throughout the United States, United Kingdom and Mexico where she has spent many long years studying in depth occult practices and magico-religious cultures. Alyne has personally interviewed voodoo and spiritual practitioners, observed forbidden ceremonies from the secret culture of 'hoo doo' in the Southern United States, and also has documented practices of numerous New Orleans, African and Latin folk rituals and healing traditions in order to educate public safety and those professionals about unfamiliar cultures. Alyne has been blessed by all the many old stories her family members have passed down to her and shared exclusively with her. Jeff Rense Program, broadcast on US satellite radio via Republic Broadcasting Network (RBN) and Internet radio. Alyne Pustanio is one of the most sought after leading lecturers on the subject of the occult, paranormal phenomena, Zombie and Voodoo hoodoo Folklore and explores the real facts associated with New Orleans Real haunted Tales, and those of the State Of Louisiana and the Greater Gulf Coast and the World. 24/7 365 DAYS A YEAR! l Ghosts And Haunting's? "THE TOP TEN MOST HAUNTED BEST AND SCARIEST MOST HAUNTED COLLEGE CAMPUSES"
Government aid is not enough. So please help. Donate what you can Now!